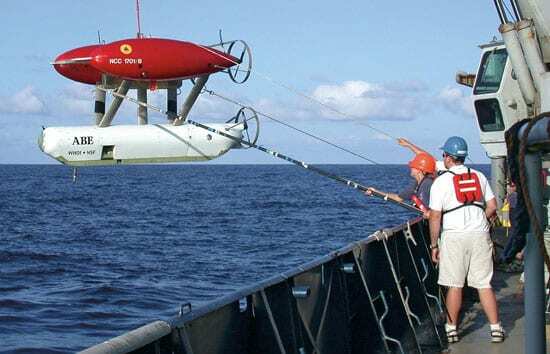 With those words, Wired magazine enshrined Woods Hole Oceanographic Institution’s deep-sea autonomous underwater vehicle (AUV) among its “50 Best Robots Ever” in January 2006. The magazine’s editors—alternating between tongue in cheek and feet firmly on the ground—compiled their favorite real and fictional robots. The Autonomous Benthic Explorer, nicknamed ABE, came in at No. 32. That was one below GM Unimate, a robotic arm that revolutionized the assembly line in 1961, and two below the Tin Woodman from The Wizard of Oz. The list contained cinematic robotic stars such as HAL 9000 (the calmly murderous computer in 2001: A Space Odyssey), R2-D2 of Star Wars fame, and the Terminator. But it also included the Mars rovers, life-saving medical devices, and military equipment such as Predator unmanned aerial vehicles and tank-treaded Packbot reconnaissance droids. The designation tickled Al Bradley, Dana Yoerger, and Barrie Walden, who designed and built a prototype deep-submergence AUV in 1995. These were the same guys, after all, who saw their real-life robot’s coincidental resemblance to the Starship Enterprise and playfully stenciled on ABE’s flank “NCC-1701B”—the same numbers that adorned the fictional Star Trek spaceship. Launched in 1995, the one-of-a-kind ABE has come of age. “It’s revolutionized how we look at the seafloor,” said Dan Fornari, director of WHOI’s Deep-Ocean Exploration Institute. But ABE’s story had more modest beginnings. Originally, Walden, head of the group that operates WHOI’s human-occupied submersible Alvin, noticed that scientists increasingly were requesting Alvin dives to return to seafloor sites to see how they had changed. He asked Bradley and Yoerger to “build something that descends to the ocean, takes a picture, docks and goes to sleep, and then wakes up and goes back to take more photos,” Bradley said. The goal was to give geologists and biologists a series of photos over time, while saving Alvin for missions only it could do. Bradley and Yoerger designed a vehicle that could be programmed to steer on a preselected path, navigating by acoustic beacons placed on the seafloor. It had three torpedo-shaped compartments connected in a triangle by struts. The design gave ABE a stable center of gravity that would prevent it from rolling from side to side or pitching forward or back. The lower pod contained ABE’s computer brains and batteries. The two upper pontoons contained glass balls to provide buoyancy. They gave ABE five thrusters to propel it up and down, as well as horizontally. They programmed ABE to automatically adjust its position to maintain the same altitude above changing seafloor topography. If ABE’s sonar detected a cliff ahead, it would stop, rise, and fly over the cliff, following seafloor contours and lowering itself back to the same altitude on the other side. “If most AUVs are airplanes, ABE is a helicopter,” said science writer Kristen Kusek in Marine Scientist magazine. 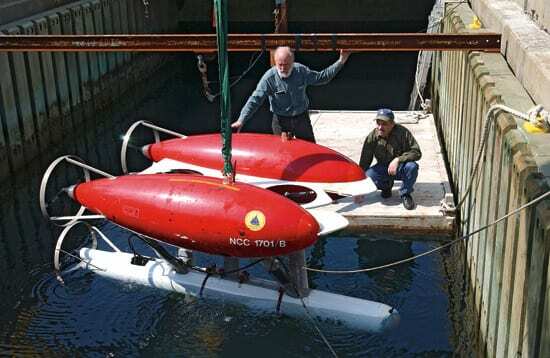 By 1995, Bradley and Yoerger had tested ABE in Woods Hole harbor and were looking for an opportunity to test it in the deep ocean. An offer came from WHOI geophysicist Maurice Tivey, who was scheduled to co-lead a cruise to the Juan de Fuca Ridge off the U.S. Pacific Northwest. Tivey wanted to measure the magnetic intensities of rocks on a newly erupted seafloor lava flow. He had planned to use the standard method of towing a magnetometer on a wire above the seafloor. What began as an engineering test piggybacked onto a scientific cruise turned out to produce exciting new data. By superimposing ABE’s magnetic measurements on ocean-bottom maps made by ABE’s sonar sensors, Tivey could distinguish the extent, volume, and timing of individual lava flows on the seafloor. “That’s when I realized that ABE could be a superb deep-submergence surveying tool,” Tivey said. ABE evolved quickly after that, as scientists began to plug different sensors into the vehicle. 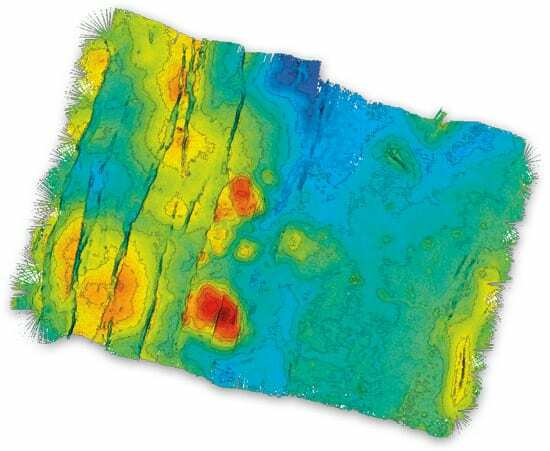 In 1999, on a cruise co-led by Marie-Helene Cormier and William Ryan of the Lamont-Doherty Earth Observatory, ABE “mowed the lawn” on the East Pacific Rise, using sonar to map the seafloor, a camera and strobe light to take photographs, and other instruments to measure the temperature and turbidity of seawater. With the latter tools, scientists discovered hydrothermal vents that Ryan said they would not have found otherwise. He was also ecstatic about the quality and detail of ABE’s seafloor mapping, calling the cruise “a milestone event” for the field of marine geology and geophysics. “This new technology will unquestionably advance our science,” Ryan said in an e-mail even before the ship docked. “It not only gives us a better view, but we see things that we have never been able to visualize before. The 1999 cruise launched ABE on a new career as scout and bloodhound, searching for hydrothermal vents. These active volcanic seafloor sites emit chemical-rich fluids that sustain exotic communities of life, and so they intrigue geologists, chemists, and biologists. But locating tiny, isolated vent sites along the globe-spanning mid-ocean ridge is akin to finding buttons in a pitch-black attic. The vents, however, leave a trail. They emit hot, buoyant, particle-filled fluids that rise several hundred meters above the seafloor and spread out into large mushroom-shaped plumes. That’s where ABE comes in, using its thermal, chemical, and optical sensors to “sniff” out plumes. Over 15 to 30 hours, ABE can cover a lot of territory, about 18 to 37 miles (30 to 60 kilometers). On a 2002 cruise to the Galápagos Rift, ABE showed its value working in tandem with other vehicles. Within two hours after ABE resurfaced from an all-night surveying mission, Yoerger could download data, create fresh seafloor maps of the area, and hand them to Alvin pilots about to descend to the seafloor. “It was like hiking with a good topographic map,” said Portland State University microbiologist Anna-Louise Reysenbach, who dived in Alvin on the Galápagos cruise. On each new cruise, ABE continues to demonstrate its versatility. In 2004, in the Lau Basin off Fiji, it first flew 820 feet (250 meters) above the seafloor, into a vent plume, and homed into the vent. (“Imagine flying at night through smog over a city to find the smokestack that’s producing it,” Yoerger said.) On successive dives, ABE descended to 165 feet (50 meters) to make a high-resolution seafloor map. Then, it hovered a few meters above the vents, taking high-resolution photos. ABE has come of age, and not only because of its designation in Wired. 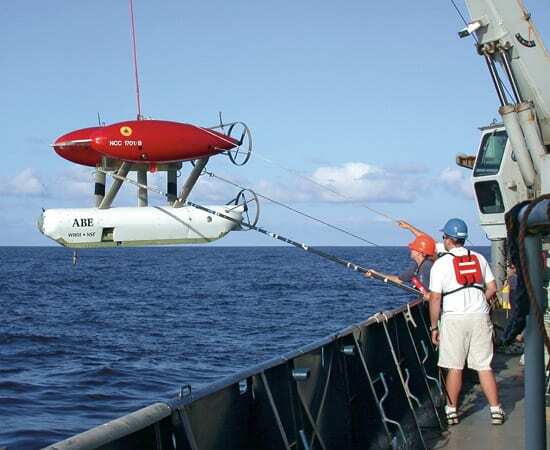 Having proved the value of deep-sea AUVs, the ABE Group has built a faster, more maneuverable, more economical, easier-to-operate AUV—the son of ABE. This next-generation AUV, called Sentry, is scheduled for its first deep-sea baptism later this month. The National Science Foundation funded the development of ABE and several ABE cruises. The National Oceanic and Atmospheric Administration also funded some ABE cruises and some additional technology development, as did the Comer Science and Education Foundation.